Something is missing at work. I think we can all agree that we want work to be inspiring and fulfilling, because it is where we spend most of our time. Work nourishes some of our most fundamental needs these days because it has become our place of community, for some it is even what we consider our family. And yet, most leaders don’t treat the work-culture that way. This article is about why we need to change our work-culture and the way we think about performance. It was published this month, in the Danish fashion magazine IN. 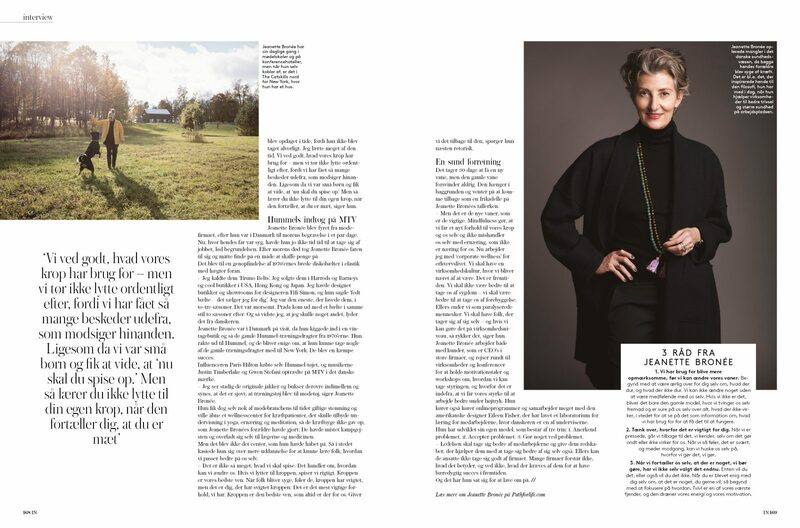 My apologies for not having a translation for non-danish speaking people, but the article talks about my journey through the ups and downs of my career, why I left fashion and how I have worked with and coached so many people over the past 15 years to cope with stress at work. I also talk about why I believe that we need our “soft values” to be the foundation for leadership in the future. Even though technology is making many of our task automated, our human resource is still the best resource and what use to be about being ahead of the competition is now about being on the edge of innovation. Problem is, going to work wears us out, we lose our edge, the creative one that is, unfortunately instead we are on the edge of exhaustion. However, with the right leadership perspective, we can create a nourishing work-culture that promotes mindfulness and self-care and work can be a thriving place, a place we actually want to spend our time and give it our best. The old way at work, we just push harder and harder to work faster and faster. The new way is that we pause and listen, before we act. Performance today is not about doing more, it is about being better. What do you need to do your best work? Another perception we need to change is that some new technology, hack, tip or tool will make us more productive. If you are tired, stressed, distracted and not productive, the solution is not new technology. The solution is something quite ancient and basic, it is so simple that we disregard it. Our very own body is the answer to human performance and self-care is the key to unlock our human performance code. Stay tuned for my new program coming up: How to unlock your human performance code. Sign up here to be kept in the loop. Also consider to sign up for the 27 Days to New Habits program (which is completely free) and you get an email every morning with a thought, a practice and a nudge to take charge of your health. Why wait?